Giving someone a bouquet of spring flowers out of your garden is a great gift for any occasion. 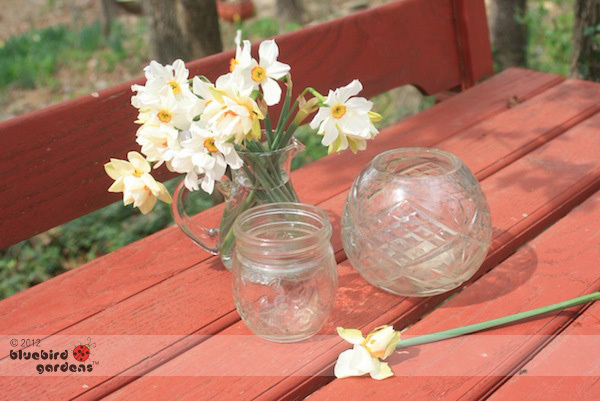 Choosing the right vase makes all the difference in how flowers look, and how long they will last after being picked. I prefer to use flower containers that are rounded at the bottom. The rounded bottom gives cut flowers access to more water, and they won't be quickly traumatized by going dry overnight. So many cut flowers don't last long because they've run out of water! There are a variety of standard flower vases florists use. If you prefer those vases, you can find them at resale shops for a fraction of the cost. Clean with vinegar and water, then run through a hot dishwasher before using again, I like using unusual containers like hand thrown coffee cups, teapots without lids, and coffee creamers. You can find them at garage sales, resale shops and thrift stores. Most of them don't have as much value without tops or because they are missing the matching sugar container but they make fun flower containers. The creamer size is one of my favorites. Creamers have rounded bottoms for water; keep flowers low on a table so people can see over the flowers, and the handle makes it easy to carry and move flowers around a room. if you don't have enough flowers to fill the creamer, add a few marbles or pebbles to hold the flowers straight, then finish with a little sphagnum moss over the top. Rose bud vases are also nice to use when you only have a few flowers; just remember once you put flowers in, there won't be much room for water so check frequently. Cut flowers take up the most water immediately after being cut so I leave mine in a vase with a lot of water for a couple of hours before putting them in their final vase. It's also good to pick most spring flowers while they're still in bud; daffodils and tulips will open nicely once exposed to warmer room temperatures.